I’ve had doily’s on the brain. 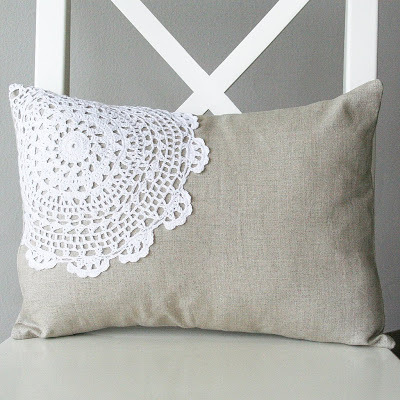 I finally found a decent sized doily yesterday and appliquéd it to a pillow. Wouldn’t it be fun to do this with doily’s from your Grandmother? I may have to do a doily search next time we make it over the river and through the woods to my Grandmothers house. Doily’s are making a comeback people. At least in my house they are. Speaking of my house….there is a highchair in desperate need of cleaning calling my name. Along with the massive pile of food crumbs under it. And 3 baskets of laundry to be folded. Of all the chores I hate to do, those definitely top my list. This time I’m going to try that whistling while I work thing, or maybe snapping my fingers like Mary Poppins. Or bribing my husband to do it……that just may work. Off I go….have a nice day! is a really beautiful pilow! I ove that pillow. You may be right about a come back… I'll surely look for some. Oooh, I love it! I'm so glad I saw this b/c I have lots of doilies that some Russian babushkas made for me when I was younger (I used to live there). They are so beautiful but I don't know what to do with them or how to display them without looking like a little old lady. My husband already makes fun of me for quilting… if I start laying doilies out, I'll never hear the end of it, ha ha! Anyway, so this is perfect! Thanks! Great idea! Next time I come across the ones from grandma, now I'll have a plan for them! WOW I would have never thought to applique a doily! Great idea! but how did you do it??? What a pretty pillow! I've had doilies on the brain too lately. I think it would look pretty to put three round doilies of different sizes and perhaps color on the bottom of a skirt for my daughter. It might look nice to overlap them a bit. The linen looks great and would work well for a skirt. What do you think? That is such a great look and relatively easy! Thanks! i'm all for a doily comeback…count me in! i LOVE your pillow! i have doily's all over my house, thanks for the great idea! I have three loads of laundry to fold, too. It's been sitting there for a week…? Yeah, I need to get to it. What a great pillow. I know I have a doily somewhere here made by my aunt, and my mom has some for me made by my grandma and great grandma. I think I'll get them from her next time I see her and make something pretty with them. love the pillow! so pretty. To be honest, I'm not a fan of the doily on fabric look I've seen over the last year, but this is the best intrepretation ever. I love that off-center applique. Question: does the applique wrap around or did you capture it all in the seams?